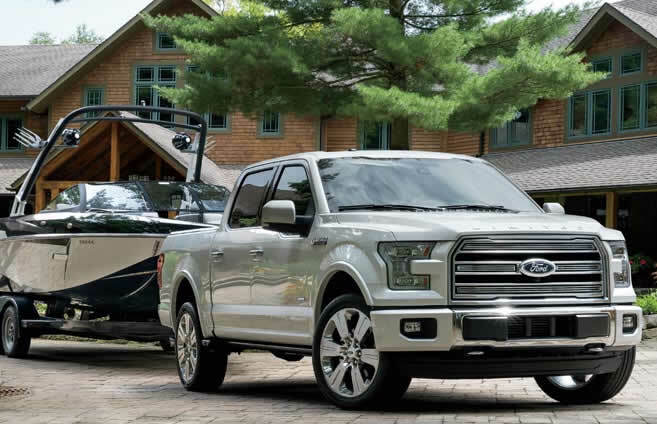 It was a huge development in the pickup-truck market last fall when Ford introduced the new-generation 2015 F-150, with a lightweight, all-aluminum body that cut as much as 700 pounds from the truck’s total weight. 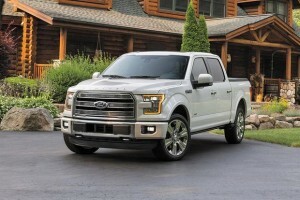 Even though the F-150 was all-new last year, Ford is introducing several significant updates for the 2016 F-150 lineup. Ford is reviving the Limited trim for the 2016 F-150, and it becomes the luxury-oriented, top-of-the-line F-150. The Limited bristles with safety and luxury features, including LED headlights, a panoramic sunroof, power running boards, remote start and tailgate release. The new 2016 F-150 Limited also offers a Technology package, which includes a lane-keeping system, a 360-degree camera and dynamic trailer-hitch assist. Most innovative might be the optional (early Ford info reports a price less than $400) Pro Trailer Backup Assist, which is a pickup-segment-first feature meant to ease the chore of accurately backing up with a trailer. Ford says Pro Trailer Backup Assist enables customers to reverse a trailer instinctively by turning a knob left or right while the truck automatically steers and controls speed. The 2016 F-150 is also one of several 2016 Ford models to introduce SYNC 3, the latest generation of Ford’s groundbreaking, touch screen-based driver interface. In addition to simplified and easier-to-comprehend graphics, the company promises that SYNC 3 has improved voice recognition and speed. A key safety upgrade for regular-cab and super-cab models adds a special front-structure brace to enable the 2016 versions of these models to earn a top score in the Insurance Institute for Highway Safety’s small-overlap frontal crash test. On an August 2015 tour of the Dearborn, Michigan, assembly plant where the 2016 Ford F-150 is built, a company official said Ford was beginning to build pilot versions of the 2016 F-150 and has plans to build a total of about 370,000 F-150s in 2015. Assembly was under way 7 days a week at the plant as Ford scrambled to keep up with demand for the F-150, which was in scarce supply on many dealer lots in early 2015. During the tour, the company said the high-performance, off-road-oriented Raptor version of the F-150 will also be built at the Dearborn plant. The Raptor is scheduled to go into production in the fall of 2016 and will be a 2017 model. What it means to you: Ford could’ve been satisfied with carrying the new-generation F-150 unchanged into 2016. After all, its radical new aluminum body might have been enough to carry it for several years. Instead, the 2016 F-150 is adding significant content and feature upgrades.